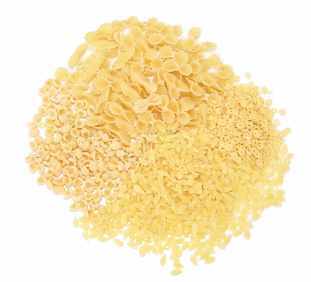 pasta Pronunciation: PAH-stuh Equivalents: One pound dried pasta yields the same amount of cooked pasta as 1 1/2 pounds fresh pasta. Notes: A staple of Italian cuisine, pasta is made with a dough that's kneaded and then fashioned into hundreds of different shapes and sizes. 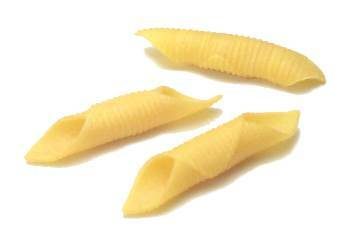 The tiniest shapes are often used in soups, long ribbons or strands with sauces, and tubes and fanciful shapes in casseroles and pasta salads. 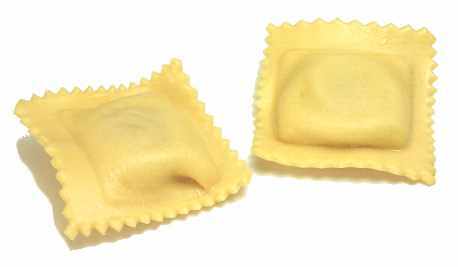 Some shapes are large enough to be stuffed and baked, and others, like ravioli, come already stuffed. 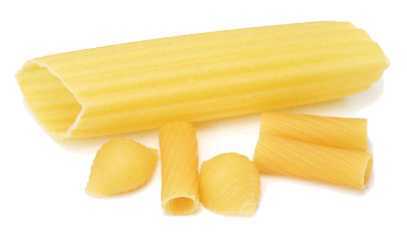 Most pasta is made with semolina, a hard wheat flour, but some producers use corn, rice, spelt, and kamut. 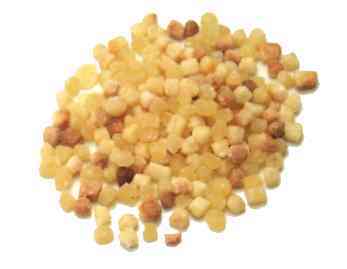 These alternative grains yield a mushier pasta, but they're a boon to people with wheat allergies. 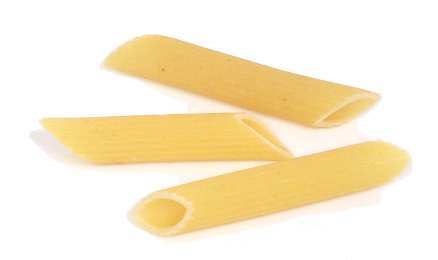 Recipes that call for pasta usually intend for you to use dried pasta, since sauces cling to it better. 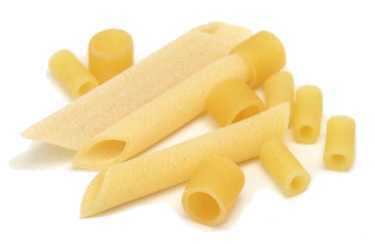 The best dried pasta is made from 100% durum wheat semolina, and has a rough surface, the better to absorb sauces. 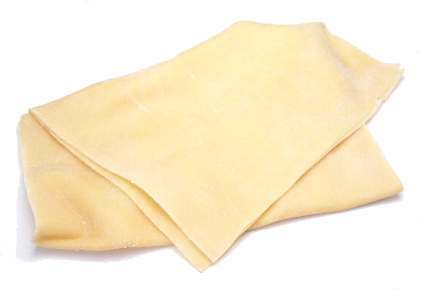 Fresh pasta absorbs flavors and works best with cream or cheese sauces. It cooks faster than dried pasta. 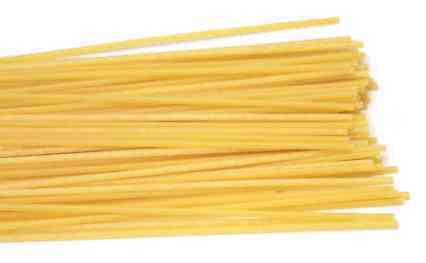 Use lots of water when cooking pasta, at least a gallon per pound. You can add salt to the water if you wish, but don't add oil. Bring the water to a rolling boil before adding the pasta. When the water returns to a boil, lower the heat to maintain a low boil. Stir occasionally to keep the pasta from sticking together. Don't cover the pot. Pasta is ready when it's "al dente." It should be cooked completely through, yet firm enough to offer some resistance to your bite. Drain the pasta in a colander, but don't rinse it unless you plan to use it in a casserole or pasta salad. Reserve a small amount of the flavorful cooking liquid in case the pasta becomes too dry and needs to be moistened. Serve it as soon as possible. 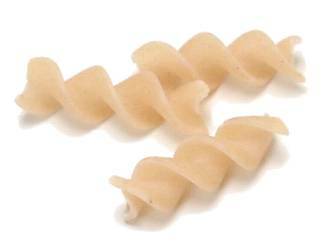 For pasta salads, select short, thick tubes or shapes of dried pasta for pasta salad. 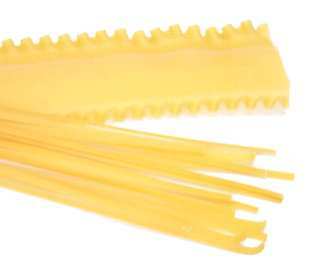 Don't use egg pasta or fresh pasta. For casseroles, select tubes with thick walls or sturdy shapes. Cook them for two-thirds of the recommended time in water, then let them finish cooking in the oven. 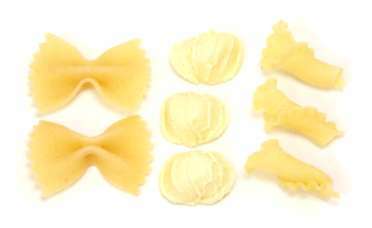 Different kinds of pasta cook at different rates, so select shapes of similar sizes if you're combining them. 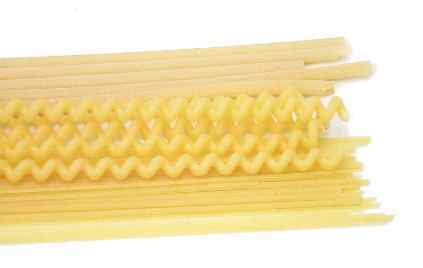 If you use a low-quality pasta, be sure to cook it in plenty of water to prevent it from getting gummy. Don't freeze cooked pasta unless it's in a baked casserole. 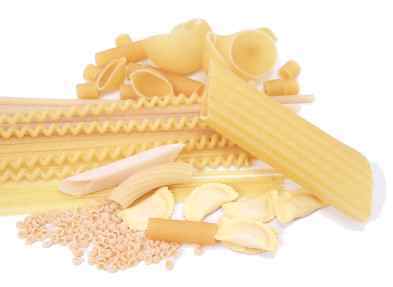 Many pasta shapes comes in different sizes. 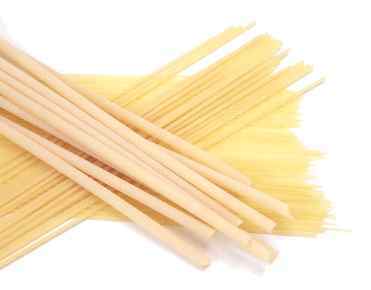 The Italian suffix "ini" means smaller (e.g., spaghettini is a thin version of spaghetti), while "oni" means larger. 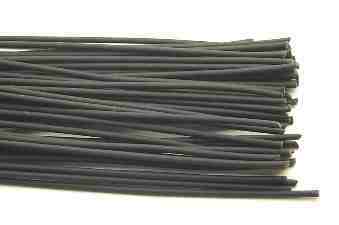 black pasta = squid-ink pasta = pasta nera Notes: This is pasta flavored with squid or cuttlefish ink, which turns it black. It's best served with shellfish. 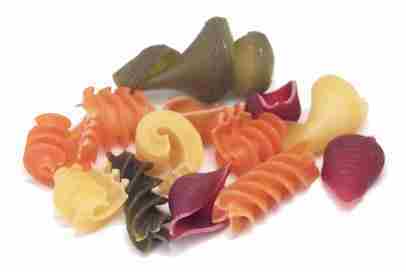 flavored pasta = colored pasta = pasta colorata Notes: Several manufacturers make flavored pastas, many of which have vibrant colors. Popular flavors include egg (egg pasta, or pasta all'uovo), spinach (green pasta, or pasta verde), tomato, beet (purple pasta, or pasta viola), carrot (red pasta, or pasta rossa), winter squash (orange pasta, or pasta arancione), squid ink (black pasta, or pasta nera), truffle (truffle pasta, or pasta al tartufo), and chile. 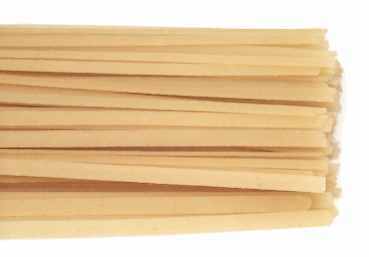 fresh pasta = pasta fresca Notes: Fresh pasta is more tender and absorbent that dried pasta, so it's best with light, delicate sauces. 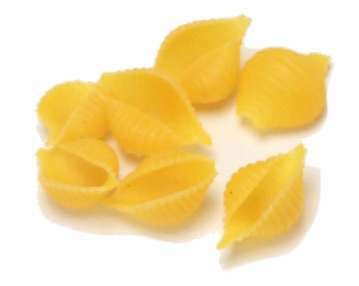 Store fresh pasta in the refrigerator for up to five days. 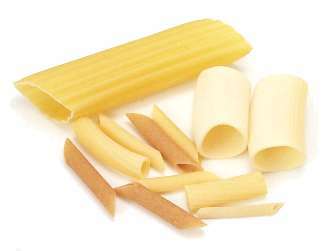 long pasta = pasta lunga = long goods Notes: This pasta comes in the form of long rods, tubes, or ribbons. Some cooks break them up before boiling them, but purists keep them long. 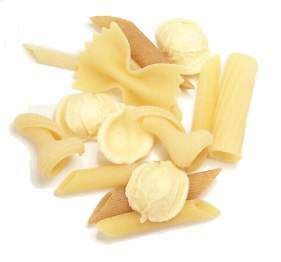 pasta ascuitta Notes: This term refers to dried pasta that's too big to be used in soups. 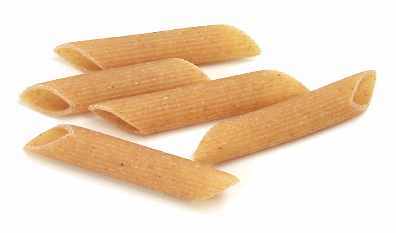 soy pasta Notes: This is made with both wheat and protein-rich soy flour. truffle pasta = pasta al tartufo Notes: This is an egg pasta that's flavored with truffles. It's normally served with a cheese sauce. 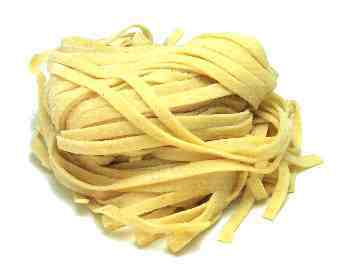 whole wheat pasta Notes: Several varieties of pasta are made with whole wheat instead of a more refined flour. This makes the pasta darker but more nutritious.